Every time you access web pages you use a Web Browser. When you go to Google, Facebook or Youtube you might do so by finding and clicking the blue “E” icon. This “E” icon is a shortcut to a web browser made by Microsoft called “Internet Explorer” (The E stands for Explorer if you were wondering). Internet Explorer or IE as it’s known, has been around since 1995 Its one of the most used browsers out there making up approximately 13% of all browser usage world wide. There have been several versions of IE which come packed with Windows OS. IE is up to version 10 (IE10) but in truth even the most up-to-date versions of IE are not as up-to-date as other browsers, take a look at how well IE9 & IE10 perform with in the html5 test compared to other modern browsers. In order to use IE9 you need to be running Windows Vista or later, If you want to use IE10 you’ll need to be running a Windows 8 or Windows RT PC. 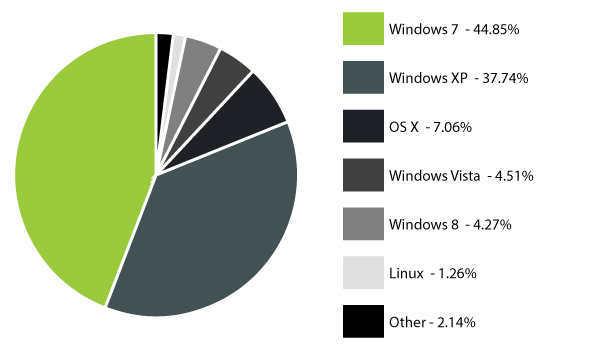 Which is a shame because Windows XP still makes up nearly 40% of all desktop and laptop operating systems. 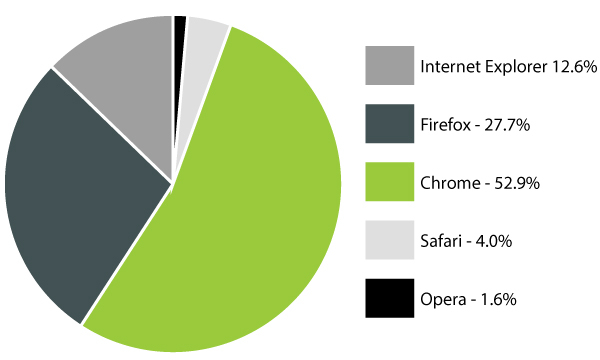 As you can see from the graph below of the 13% of Internet Explorer users the majority are using IE8. So whats so bad about Internet Explorer? In fact out of the top 5 web browsers (Internet Explorer, Firefox, Safari, Chrome & Opera) IE is the least standards compliant browser. This means if a website does look the same on IE and, for example, Chrome it’s likely a tremendous amount of background programming has been done to make it possible. 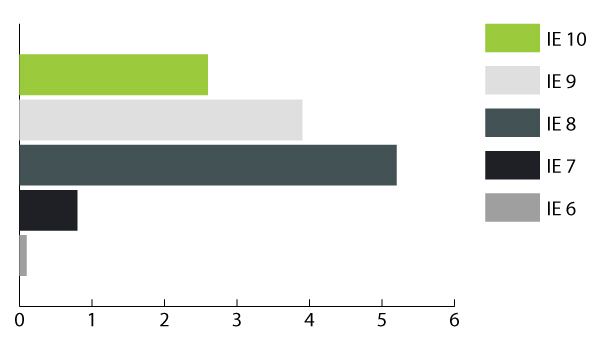 It’s no surprise that since IE8 is so old it’s one of the slowest browsers available. You can find stats all over the internet for various tests for page loading time etc, bottom line is that IE8 is always near the bottom. Even IE9 and IE10 are still behind in comparison to the other top 5 web browsers. The speed your browser loads a page is important not only is it annoying to wait for a web page to load but slow loading can also cause your browser to crash or freeze. Both Mozilla Firefox and Google Chrome offer you the ability to open the same tabs you have on your desktop as on your mobile devices and synchronise your bookmarks via the cloud so you can access them on any device you’re signed into. Since Internet Explorer is only available on Windows it means you can’t continue reading on your Ipad or Android. https://addons.mozilla.org/en-US/firefox/) there are literally thousands of things to choose from to personalise you browser. IE is not open source so only has a handful of plugins and add-ons available. Internet explorer is popular, so for anyone who wants to infect your computer with malware or a virus IE is often targeted. Unlike modern browsers bugs and vulnerabilities are fixed in IE on a schedule not as they are found so even after a vulnerability is found it won’t be fixed until the next scheduled update which can take six months. We’ve mentioned Google Chrome and Mozilla Firefox in this article and both are excellent they’re also FREE. Google Chrome is the most popular of the two and it integrates nicely with your Google account so it’s the one we recommend the most. But we suggest you download both Firefox and Chrome and try them out for yourself. As you can see there are a lot of reasons to start using an up-to-date web browser, after all the majority of time you spend on the computer you spend online and that means using a web browser. Whatever you do online, read emails, shopping, banking, updating your Facebook status or anything else a modern web browser will do it safer, faster and prettier. Like most web companies including Google we have ceased support for IE7 or earlier, it’s not an effective use of our time. When it comes to IE8 we do spend time making sure that your website works and looks as good as possible but due to its limitations it simply can’t do everything a modern browser can. Do geeks like me and the Internet in general a favour. Update your browser. Stop using IE. Make your computer more secure. Make the web a better place.